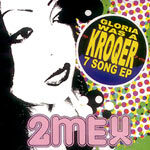 2Mex drops this short EP mixing and mashing some of his favorite KROQ songs with new and previously released lyrics. So basically, a few of the songs are mash-ups, the rest are new lyrics or re-workings of KROQ classics! Definitely more rock oriented than hip hop wise, but still dope! Please note: cover art may not be as shown here.